WOW!!! The Pope is Stepping Down!!!!! 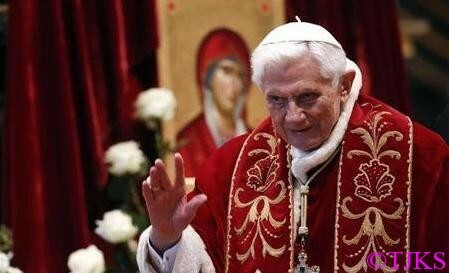 VATICAN CITY (Reuters) – Pope Benedict said in a historic announcement he no longer had the mental and physical strength to run the Roman Catholic Church and would become the first pontiff in more than 700 years to resign, leaving his inner circle “incredulous”. The pope, known for his conservative doctrine, did not intend to influence the decision of the cardinals who will enter a secret conclave to elect a successor, Vatican spokesman Father Lombardi Federico said. Benedict stepped up the Church’s opposition to gay marriage, underscored the Church’s resistance to a female priesthood and to embryonic stem cell research. A new leader of the world’s 1.2 billion Roman Catholics could be elected as soon as Palm Sunday, on March 24 and be ready to take over by Easter a week later, he said. Lombardi said the pope did not fear a possible “schism” but several popes in the past, including Benedict’s predecessor John Paul, refrained from stepping down precisely because of the confusion and division that could be caused by having an “ex-pope” and a reigning pope living at the same time. “This is disconcerting, he is leaving his flock,” said Alessandra Mussolini, a parliamentarian who is granddaughter of Italy’s wartime dictator. The pope’s elder brother Georg Ratzinger, a frail 89-year-old priest who shares the pope’s passion for music, told reporters in the Bavarian town of Regensburg where he once conducted the cathedral choir that he had been “very surprised” to learn of his brother’s resignation. “He alone can evaluate his physical and emotional strength,” said Ratzinger. Lombardi said Benedict would first go to the papal summer residence south of Rome and then move into a cloistered convent inside the Vatican walls. It was not clear if Benedict would have a public life. The last Pope to resign willingly was Celestine V in 1294 after reigning for only five months, his resignation was known as “the great refusal” and was condemned by the poet Dante in the “Divine Comedy”. Gregory XII reluctantly abdicated in 1415 to end a dispute with a rival claimant to the papacy. Lombardi said Benedict’s decision showed “great courage”. He ruled out any specific illness or depression and said the decision was made in the last few months “without outside pressure”. While the pope had slowed down recently – he started using a cane and a wheeled platform to take him up the long aisle in St Peter’s Square – he had given no hint recently that he was mulling such a dramatic decision. “I am really surprised,” said Ricardo Rodriguez, a Portuguese tourist in St Peter’s Square. “I hope the next pope can be better than this one doing the best for the world and Catholics,” he said. Elected in 2005 to succeed the enormously popular John Paul, Benedict never appeared to feel comfortable in a job he said he never wanted. He had wanted to retire to his native Germany to pursue his theological writings, something which he will now do from a convent inside the Vatican. The resignation means that cardinals from around the world will begin arriving in Rome in March and after preliminary meetings, lock themselves in a secret conclave. He referred to “today’s world, subject to so many rapid changes and shaken by questions of deep relevance for the life of faith”. Before he was elected pope, the former Cardinal Joseph Ratzinger, was known by such critical epithets as “God’s rottweiler” because of his stern stand on theological issues. The Archbishop of Canterbury, leader of the worldwide Anglican communion at odds with the Vatican over women priests, said he had learned of the pope’s decision with a heavy heart but complete understanding. Elected to the papacy on April 19, 2005 when he was 78 – 20 years older than John Paul was when he was elected – Benedict ruled over a slower-paced, more cerebral and less impulsive Vatican. Despite great reverence for his charismatic, globe-trotting predecessor — whom he put on the fast track to sainthood and whom he beatified in 2011 — aides said he was determined not to change his quiet manner to imitate John Paul’s style. A quiet, professorial type who relaxed by playing the piano, he managed to show the world the gentle side of the man who was the Vatican’s chief doctrinal enforcer for nearly a quarter of a century. The first German pope for some 1,000 years and the second non-Italian in a row, he travelled regularly, making about four foreign trips a year, but never managed to draw the oceanic crowds of his predecessor. Scandal from a source much closer to home hit in 2012 when the pontiff’s butler, responsible for dressing him and bringing him meals, was found to be the source of leaked documents alleging corruption in the Vatican’s business dealings, causing an international furor. Benedict confronted his own country’s past when he visited the Nazi death camp at Auschwitz. Calling himself “a son of Germany”, he prayed and asked why God was silent when 1.5 million victims, most of them Jews, died there during World War Two.